Akron Children’s Hospital is eagerly awaiting the addition to the existing Considine Professional Building by Welty Building Company Ltd.
ConstructionEquipmentGuide.com – May 29, 2018 – AKRON, Ohio – The $82 million, 230,000 sq. ft. addition began in March 2017 and will be completed in the summer of 2018. The new addition continues the campus transformation that began in 2012 with the Kay Jewelers Pavilion. This building included a new emergency department, neonatal intensive care unit and GOJO Outpatient Surgery Center. The Considine Building, an eight-story building located on 2.25 acres at the southeast end of the hospital’s campus, will be connected to the main hospital and Kay Jewelers Pavilion via a 250 ft. long elevated bridge over Bowery Street. With the addition, the Considine Professional Building will grow to 480,000 sq. ft. This most recent expansion of the hospital’s master plan provides subspecialty practices in Akron and allows the hospital to consolidate functions such as outpatient clinics and programs currently located in leased downtown sites. The addition consists of 94,500 sq. ft. of clinical space; 47,700 sq. ft. of offices; and another 53,700 sq. ft. that will allow for the expansion of future business objectives. The original estimates for construction costs were more than $100 million. These estimates were validated by third party estimators at market value. The team, using an integrated lean project delivery method, worked together to decrease costs to $82 million. This system emphasizes open and honest collaboration to eliminate construction waste and maximize value. During a 10-month planning and pre-construction period, the team, consisting of the owner, designers and contractors, worked together on more than 450 innovative ideas that were documented and communicated through an A3 process. Welty crews broke ground on March 6, 2017 with an aggressive 17-month construction schedule. To meet these high demands, the team coordinated through a 100 percent 3D model that included every building component from structural steel to the nuts and bolts in the ductwork. This highly-coordinated effort was led by Phillip Nagle, Welty virtual design manager. Through the model, critical components of the building were pre-manufactured and installed as unitized components, decreasing installation time and increasing efficiencies. “The shell of the building consists of 218 panels that were built off site and delivered with the windows, brick ties and AVB already installed, which dramatically reduced the enclosure schedule,” said Brad Nagy, assistant superintendent. The project has endured many harsh conditions due to the Ohio climate. March of 2018, for example, was on average 10 degrees colder than is typical and had 30 percent more precipitation than is average this time of year for the region. Luckily, weather-related delays only temporarily hindered the project, and the project’s critical path was maintained. “By May we had departments moving into the fourth floor while the building was still under construction on the other levels,” said Greg Komar, Welty project manager. A temporary occupancy permit allowed the team to move forward on renovation work on the existing Considine 4th Floor. The work to prepare the site started in March 2017 and was completed in early summer 2017 by demolition and excavating company Kiehl Building Services Corp. The steel erection began in mid-July 2017 by Forest City Erectors Inc. The building was erected as three separate tower sections with two cranes on site. 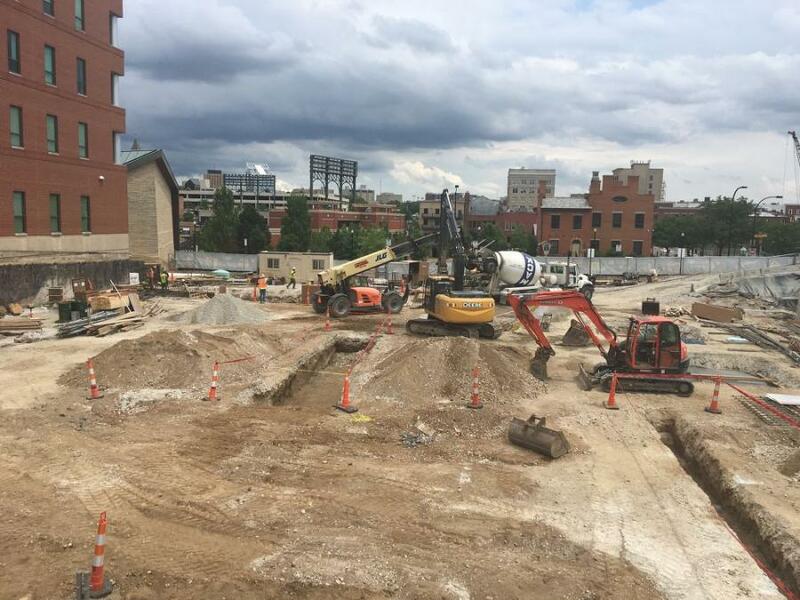 When safe to proceed and through tedious planning and coordination, the team instituted a fast-tracked nine-day concrete pour cycle consisting of: sleeve layout, sleeve installation and concrete deck pours. Ted Marcum, a Welty superintendent, explained the equipment sharing program. “All equipment is shared and assigned,” Marcum said. “A master equipment board with a description and who has temporary ownership is in the team planning room. The interior equipment list is updated as needed to track which floors the equipment is on and when trade partners will complete work requiring the lift. JLG aerial and all 4×4 scissor lifts are tracked in the same manner and are scheduled well in advance in the weekly planning meeting. They are also shared between the trade partners according to the work to be performed on the exterior of the project. Equipment used throughout the course of the project includes: excavators, dozers, scissor lifts, all-terrain forklifts, a drill-rig equipped with a grout pump, boom lifts ranging from 40 to 150 ft. and a combination of cranes ranging from 40 to 350 tons. All Aerials and ALL Crane were the primary equipment providers for the project. They were so critical to the project that Welty asked them to sit in on the weekly coordinating meetings with the team. “At one point we had as many as five cranes on site at once and with daily coordination,” said Nagy. An average work day included 180 construction personnel on site. Welty’s partners on the project include: Kiehl Building Services for excavation and site utilities; Donley’s for concrete; Forest City Steel; TH Martin for mechanical; Gorman Lavelle for plumbing; JW Didado for electrical; US Communications and Electric Inc. for communications; Grunau Company for fire protection; the CCG Company for building automation; OCP for exterior shell, metal studs, drywall, cement and fireproofing; Messina Flooring Company; Yerman and Young for the painting; Foti Contracting for masonry; Tycor Roofing; and United Glass. With so many workers on site daily and many dangerous operations taking place at any given time, safety was of the utmost importance. “We have done 779 safety orientations since the start of this project, but maintain a number just under 200 employees on most days,” said Jim Keyerleber, Welty safety manager.